Providence will provide turn-key development services including, but not limited to, obtaining both construction and permanent financing for the project and collaborating with our client to assemble the project budget and the development team. 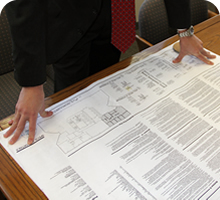 Coordinate land acquisition and land use agreements. Form the ownership entity and develop the lease agreement. Acquire construction financing and permanent financing for the project. Oversee the programming, design, and engineering of the facility as well as suggestions for value engineering. Handle project management from start to finish including responsibility for conducting project team meetings. At Providence, we pride ourselves for being an “open book” company. As your development partner, transparency is a condition of our partnership. The project books are always open and available for client review. We look at relationships as partnerships—not just business transactions. We will set schedules and meet them. We will have your best interest at heart throughout the project. We understand that you are the client and the sole judge of our performance. Providence is thoroughly familiar with the responsibilities and obligations required of a developer on projects of any size. Our approach is to evaluate all systems for the project from a cost and schedule standpoint and to present as many options as practical for consideration.